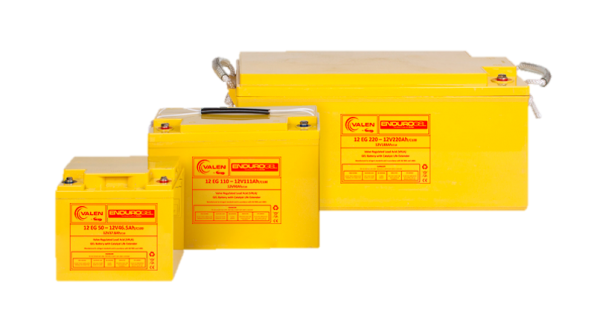 Like most industrial batteries, VRLA (Valve Regulated Lead Acid) batteries are very easy and safe to handle. Because the electrolyte in the battery is immobilised using either Gel or Absorbent Glass Mat (AGM), VRLA batteries are considered to be ‘dry’ or ‘sealed’ and can be handled and shipped accordingly as non-dangerous goods. A VRLA battery is housed in a plastic ABS casing and this arrangement is considered to be rugged. However, general safety measures should always be applied when handling any industrial battery. Additionally, if the casing of the battery is damaged, the contents which include lead and sulphuric acid, will become exposed and pose the typical dangers associated with these materials. In this blog, the industrial battery experts at Valen take a look at some important safety advice for handling VRLA batteries. Sulphuric acid can cause burns and serious injury if it comes in contact with your skin or eyes. In the event of contact with Sulphuric acid, flush thoroughly with water and seek medical attention immediately. Should an acid spill occur, if safe to do so, first rinse the contaminated area with plenty of clean water. Use ½ kg of baking soda in 4 litres of water to neutralize any possible acid. Kitchen dishwashing liquid in water makes a good neutralising agent. Do not use cleaners or solvents on any part of the battery. Where all batteries are stored, keep an acid leakage or spill kit and the Poison Hotline number (13 11 26), so you are prepared for the unthinkable. Disconnect all power before attempting to install, remove or perform any maintenance work. Keep batteries clean and dry. A layer of moisture across the battery may cause accelerated discharge and result in over-discharge of the battery, leading to premature malfunction. Do not allow excessive dust to accumulate on the battery or cabling. Keep battery connectors clean, greased and tight. A loose connection can reduce battery standby time and cause battery fires. Do not handle batteries that have been dropped or where the container has been ruptured except while wearing the correct PPE equipment including rubber gloves, face masks etc. Do not try to disassemble VRLA batteries. Never charge or use batteries in an airtight space or container. As part of the battery design, small amount of gas is released through the battery valve. This gas consists of mostly hydrogen gas and can explode if ignited in a confined area or space. Keep sparks, flame, or any other ignition source (including smoking materials) away from batteries at all times. Keep all metallic objects away from the battery terminals; even the smaller batteries are able to deliver large amounts of energy on a dead short. Creating a short will deliver huge amounts of energy resulting in injury or fire. Never lift more weight than stated by Workplace Health and Safety regulations and company policies. Ensure correct lifting procedures and methods are used. Always refer to the relevant I&O Manual of any VRLA battery. You can find this information for every Valen battery on each “product group” page under “Downloads” on our website. Need some extra advice on how to safely handle VRLA Batteries? Just ask us! We are proud to offer all our clients the highest level of technical support. For more expert help and advice, talk to one of our knowledgeable team members by calling 1300 734 253. Or simply click here to contact us.